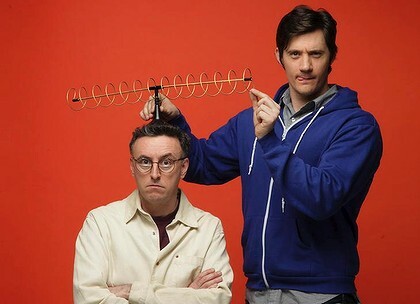 Full disclosure: I was a huge fan of Get This, the Triple M program and podcast that originally brought Tony Martin and Ed Kavalee together, along with the much-missed, much-loved Richard Marsland. So I’m a little biased. Having said that, I got more laughs out of the opening segment of The Joy of Sets than I did out of a whole episode of Good News World. These guys have a natural, easy chemistry that just works, whether it’s on radio or television. That chemistry comes across here, and they mine some fine material out of the weird and wonderful that is the history of television. First of all, though, someone needs to get them some better chairs. The whole show was a little bit awkward and a little bit clunky, and I think it will benefit as time goes on, once the guys become more comfortable in their roles and the editing becomes less jarring. It should be less scripted as well, but that might prove too high a degree of difficulty, especially for a first episode. On top of that, I actually don’t have all that much to say about ‘The Joy of Sets’. It was funny, pretty interesting, a little awkward and charming. Much like the guys themselves, I suppose. I think it would probably benefit from being on a little bit later and have less pressure on it. It strikes me as being more suited to a later timeslot a la the panel or Merrick and Rosso Unplanned. I hope people, and Channel Nine, give it a chance because I thoroughly enjoyed it. Check it out next week!